In a recent article from CBS News, readers learn of a two-year-old boy suffering from a rare genetic condition that affects his mobility. According to the boy's family, who live in Farmington, Minnesota, they couldn't afford to spend upwards of $20,000 for the specialized wheelchair they desired for their son. 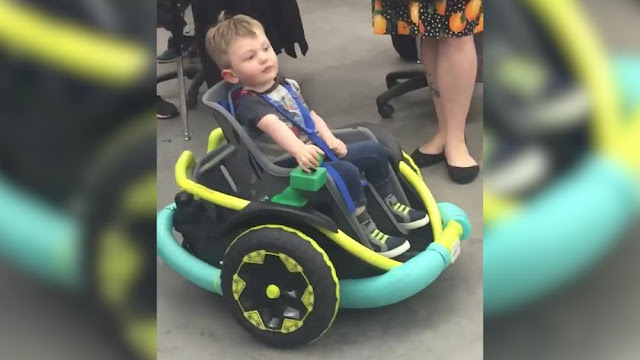 In hopes of receiving some assistance from the community, the toddler's parents contacted the local high school robotics team, named Rogue Robotics, who in turn collaborated with the University of Delaware's GoBabyGo program to build the custom wheelchair for the little boy. According to the team's coach, it took the group a couple of weeks to build the vehicle, and they completed the project in time to deliver it to the family just before Christmas. Oddly, however, where the average reader may see a story of compassion and charity, the Left witnesses an opportunity for controversy and exasperation. "We live in a dystopian nightmare, where 2 year old children with acute mobility challenges (AND WHOSE PARENTS HAVE INSURANCE) must rely on a high school robotics team for basic healthcare needs." Notwithstanding the fact that we all rely on somebody, whether through partnership or through commerce, what's dystopian about people helping people who can't afford something? One of the most dreadful aspects of the modern Western world has been its seeming insistence on programming institutional (and coercive) "solutions" instead of voluntarily collaborating for improved outcomes with neighbors within our respective communities. This insistence on macro approaches to problem-solving has distanced us from our communities and the people who live among us, which has rendered us less safe and more cynical about everyone and everything. Even in the case of charity, the modern Westerner cites it as an abomination instead of celebrating the act of compassion. Clearly, the family didn't require just a basic electric wheelchair, which can be purchased for hundreds of dollars from Walmart. What's more, the fact that medical and hospital expenses are so inordinately expensive in the United States can be traced back to the artificially high costs of labor, malpractice insurance and regulatory compliance, the new age of non-actuarial "insurance" and fundamentally the non-productive aspects of a debt-based service economy "based on consumption" and cheap money. This sort of commentary also operates from a gross misunderstanding of the nature of economics: the economy exists not to supply everything that one can imagine he or she could ever want, nor does it exist to supplant family and community networks. On the contrary, it exists to complement these features of life that exist beyond the monetary domain, whose nuances are best appreciated by the people who live most local. While the market has made such great advances through specialized labor and economies of scale, it is important to remained focused on those aspects of life that it cannot independently replace: the compassion of voluntary expressions of charity, mentorship and leadership; the personal investment of time, labor and capital in one's own family or community; the discovery of one's passion or purpose. The application of self in these directions serves as the adhesive for community, and any movement that intends to systematize or automate these decisions (through coercion or otherwise) will serve only to deprive humanity of the greatest source of fulfillment the world has to offer.